The Eighteenth Judicial District Commission on Judicial Performance recommends unanimously that Judge John L. Wheeler BE RETAINED. 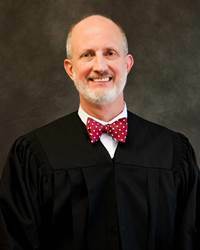 Judge Wheeler holds a degree in government from Cornell University, earned in 1968, followed by graduation from the University Colorado School of Law in 1982. After 23 years specializing in civil litigation with two law firms, he was appointed as a District Judge in Arapahoe County in 2006. Judge Wheeler completed a course in criminal procedure at the National Judicial College in 2008. His current docket is 65% criminal, 33% civil and 2% domestic. In July, he will move to a 100% domestic docket. Judge Wheeler believes that participation in the community outside the courtroom is important. During the past term, he has lead attorneys and law students in the Doyle Inn of Court, submitted articles to Colorado Lawyer, revised all forms used in Arapahoe County Courts to advise criminal defendants of their rights, judged student Moot Court competitions for Denver University, Colorado University, Arapahoe High School and the Arapahoe County Bar Association’s competitions. Judge Wheeler has been a member since 2001 of Hana’s Hope, a nonprofit organization that assists low-income adults and children with hair loss following chemotherapy and radiation therapy. The Commission finds that Judge Wheeler is a strong judge and experienced judge who should be retained in office.